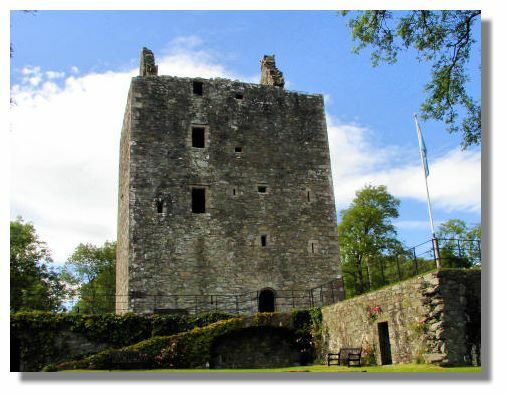 Cardoness Castle is first mentioned in the records in 1220, when a Nicholas de Kerdenes and his wife Cicely were in dispute with the monastery at Dundrennan over Cicely's dowry - the litigation went on for over 20 years! Nicholas was probably descended from one of a number of Anglo-Norman lords who were persuaded by the King of Scotland to settle in the area in an attempt to reduce the power of the Lords of Galloway. The newcomers were well advised to build strong castles and many of these survive. The history of the owners thereafter is somewhat vague - Bertram of Cardoness witnessed a charter in 1277 by Lady Dervorguilla, the mother of John Balliol who became King of Scotland in 1292, so the family was well connected. Then in the 15th century the McCullochs (from Wigtownshire) acquired the estate from the laird of Cardoness, probably through marriage. Gilbert McCulloch is the first to turn up in the records and it was either Gilbert or his son James who built the present castle. The McCullochs were a powerful family from Galloway, who were frequently in dispute with their neighbours, both via litigation or by breaking into a barn and stealing 1,500 assorted beasts! When Thomas McCulloch, a minor, inherited the castle and estate in 1509, Patrick MacLellan seized the castle in retaliation for earlier misdemeanours by the McCullochs. The constant disputes with their neighbours eventually had a detrimental impact on the McCulloch finances and the property had to be mortgaged. By 1628 it was legally owned by the Gordons of Upper Ardwall, though the McCulloch descendants committed sometimes violent deeds in their attempts to win it back. Finally, Godfrey McCulloch shot the head of the Gordon household and was eventually executed in Edinburgh on "The Maiden" - the Scottish equivalent of the guillotine. Cardoness was abandoned after that, though ownership passed through many hands until 1927 when it was placed in State care. It is still looked after by Historic Scotland. or go to the next castle: Carsluith Castle.